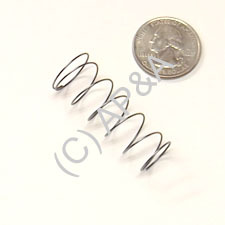 Tapered coil plunger spring commonly used on devices where maximum spring compression is required. Tapered design lets spring compress nearly totally flat without spring coils mashing over themselves. Commonly used on vertical up-kickers, auto ball launchers, and other high-powered devices. Makes a great replacement for flipper plunger springs on older games like electro-mechanicals and early solid-state games. Measures approx. 1-3/4 inches long, 5/8 inches diameter. Commonly used on later-model Sega and Stern Pinball games but can be used on any make/model. STERN: Lord of the Rings, Pirates of the Caribbean, Simpsons Pinball Party, Space Jam, Starship Troopers, more?